A few weeks ago in God's providence I landed in four days of evangelism training with the unusual name of "Hyper Discipler". I would not have had the sense to attend the training if a kind friend had not offered it to me and a select group of other friends for free (including meals!). I have to call the teacher simply "Trainer Jim" for security reasons. He spends a large part of the year training Christians all over the world, including places where they are physically persecuted. Trainer Jim is well past the average retirement age, but he's still brimming with passion. Thankfully God has given him good health and a sharp mind and a supportive wife, so that he can keep doing what he (and He) loves. I was a bit nervous going into this training because there are a lot of evangelistic methods out there that I cannot use in good conscience. There are so many unbiblical ways to talk about Jesus, ways which omit or twist vital aspects of the gospel. Go look at the gospel tracts you find in most churches and see what I mean. So I was gladdened to find I agreed with and could use almost everything I learned during these four days. How to describe the content of the teaching? It is a unique blend of the best of the teachings that Trainer Jim has picked up during his lifetime of Christian ministry. During the day, he taught us his evangelism method, which is a sort of a tweaked combination of The Way of the Master with Simply the Story. Each day we went out on the street and practiced what we were learning. Then we came back together to tell what had happened and rejoice in and learn from each other's encounters. In the evenings he taught information based on the book Cat and Dog Theology and a seminar called UnveilinGLORY. Yeah, that's what I thought too, just based on the names. Reading the book was a prerequisite for attending the class, and it turned out to actually be quite good. It's sort of a street level Desiring God, and stepped on my toes surprisingly regularly. The basic point of Cat and Dog Theology and UnveilinGLORY is that God's glory (fame, reputation, honor) is more important to Him than anything else, including us. Then it extends that truth out to talk about how it affects our approach to prayer, evangelism, and missions. God's global fame should be the focus of our lives. But all of what I've told you so far is merely a prelude to what I want to say. This time of training came to me during a season of discouragement. Somehow the Lord used it to give me hope. In thinking back, I tried to analyze what exactly made Trainer Jim's course impact me in ways that other seminars and trainings have not. One vital factor, I realized, was the other people in the class. Although coming from different cities, churches, ages, and levels of maturity, one thing that united us was a passion for spreading the supremacy of Jesus. All of the people there were already active in evangelism in their own communities. Whether we were praying together or evangelizing together, they were on fire. I found myself one of the most timid of the attendees. But rather than making me feel shame, the warmth of my companions emboldened and encouraged me. Closely related to that was the concentrated amount of time we spent together. Each day started at 9 AM and ended after 8 PM. We ate together, and had rich times of spontaneous interaction about weighty topics related to the gospel and its proclamation. Many of the other students had lots of interesting experiences and insights into Scripture to share. Of course, the best way to learn something is to actually do it, and that is why each day's immediate application of the teaching was so helpful. An hour of witnessing on the street is worth a week in an evangelism classroom. Finally, it was refreshing to be in an environment in which rigorous training was married so beautifully to dependence on prayer. Trainer Jim seems to have learned that "the horse is made ready for battle, but victory belongs to the Lord", so he frequently integrated group prayer during class times. As I've already said, my classmates' intensity ensured that these prayers were not routine mumbo-jumbo. On the final day of the training, we split into two groups and went out on the street again. The group I was with first went to a ballpark where we'd had good conversations the previous day. But hardly anyone was there, so we went to another park. There were even fewer people there, but Matthew spotted a few teenagers sitting at a picnic table. "I'll go talk to them," he volunteered. We parked, he jumped out, and within about two minutes he and the other two men in my team were already engaged in conversations. I wandered around, afraid I would not have enough courage to approach anyone. I noticed a lot of cars parked outside the city's recreation center, so I walked over there. Two men were just coming out to the parking lot. I went up to one of them and said, "I'm here talking to people about Jesus. Do you have a church background?" He didn't, and it turned out to be perhaps the best conversation I've ever had with a stranger about Jesus. I went through the entire "Hyper Discipler" gospel presentation with him, which took about half an hour. He ate it up. He may have become a Christian. After I finished talking with him, my teammates were still engrossed in conversation and I had to use the restroom, so I went in and used the one in the rec center. I was about to leave when I noticed a group of six youngsters (probably between age 10 and 12) hanging out together near the entrance. I told myself that kids that age would not be interested in talking about Jesus. Then one of them waved. I was so surprised that I turned around to see if there was someone behind me. He was waving at me! He asked how I was doing and I asked if they wanted to hear a Bible story. They did. So I got to talk with them about Jesus too! So I came away from the training refreshed and rejoicing, because I had seen that God is still at work. He is at work in the hearts of His people, stirring them to proclaim Jesus. And He is at work in those who are not yet His people, giving them a readiness to hear. Will you join me in finding them? If you live near me, I would love to go out on the street with you. If you don't know how to witness, I can show you what I have learned so far. If you have a group of people interested in Trainer Jim's Hyper Discipler program, contact me and I can put you in touch with him. This isn't a book about me, it's about the guy I was named for. And actually, it's about his God. Often when we read the book of Daniel, we either focus on his heroic choices to obey God amidst pressure to compromise, or on horns and statues and Antiochus Epiphanes. The Gospel According to Daniel is so refreshingly different. Bryan Chapell writes with the gravity and honesty and simplicity of one who knows suffering firsthand. This is not a book of beautiful words and humorous anecdotes. This is the book that will take you to the marrow of Daniel, and strengthen you for dark days. If your life is not difficult, you probably will not enjoy it. It's not a verse-by-verse exposition of every nuance of the book, but it is a clarifying 'big picture' walk through each chapter. What Jesus on Every Page does in brief for the whole Bible, this book does for Daniel. Prepare to have your heart strengthened by Daniel's descriptions of the God of grace redeeming sinners and preparing the timeline for the Messiah. I have read and reviewed a lot of books on Islam. But Seeking Allah, Finding Jesus is the best of them. It contains the strengths of the other books without their weaknesses. It explains what Muslims believe (clearly, accurately, and without ad hominems). It explains how Muslims live (most of them are family-oriented, peace-loving people who think the Quran teaches peace). It explains why they think Christianity is false (giving and refuting their arguments in detail). And yet it does all this without being even slightly boring. In fact, my parents found it so compelling that they finished reading the book before I did. The reason this book is so captivating is that it is not just a collection of facts about Islam; it is the true story of a real Muslim's journey to Christianity. It blends emotional intensity with intellectual rigor. Nabeel Qureshi was raised by parents far more pious and kind than many American parents, and he followed Islam more wholeheartedly than a lot of professing Christians follow Jesus. At an early age he learned refute the average Christian's arguments for the Bible. So it's all the more amazing that he ever became a Christian. Telling his parents of his conversion was the most heartrending moment of his life. (And you'll understand why when you read it.) His conversion shows both the value and the limitations of apologetics. But he did convert. And the reason seems to be that in the end, his love for truth exceeded his love for everything else. For many people, their love for friends, family, pleasures, or even sin exceed their love for truth, so they suppress the truths they know about God and follow an ideology that leaves their idols alone. To those who really do ask, seek, knock in pursuit of the truth, to those who hunger and thirst for righteousness, Jesus has promised answers. This book demonstrates how He gives them. Please read the book. And then look for a Muslim friend with whom you can share it. I received this book for free in exchange for an unbiased review. My review was not required to be positive. 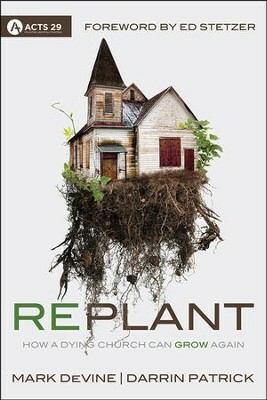 Replant is an easy read. It is a true story, a story told simply and compellingly, a story that at some level many pastors would like to be their own. It is the story of an old historic church with a beautiful building in downtown Kansas City. As often happens to old historic downtown churches, this one journeyed all the way to the fringes of extinction. When Mark DeVine became interim pastor it was dying under the weight of its glorious past. His first challenge was surviving. Previous pastors had been squeezed out by less than enjoyable processes. He describes how he discovered and conquered the shadowy clique ("the cartel") that was running the church behind the scenes. But then he came up with the idea that the church, to move into its future, needed to give up its autonomy as a church and become a satellite church of Darrin Patrick's Journey Church in St. Louis. The church did, and it worked. They now have their own pastors and are bursting with people and activity. It almost conveys the idea, "It worked for us, so what we did must have been God's will." This is the danger of a book about church revitalization that is a story rather than an exposition of Scripture. Pastor DeVine remarks that one reason he was able to survive the battle with the cartel is because his family was not with him at the church. I'm sure that did make it easier for him (and for his family) as an interim pastor. But I still think his ministry as a whole would have been enriched had his family joined him at the church for his ministry there, because pastoring is so much more than preaching and running business meetings. In some ways, he seems to have functioned more as a CEO than a pastor. In general, I'm uncomfortable with the philosophy of one church being run by another church. There just seems no model for this in Scripture. The closest would be the apostles running churches that were weak. But Darrin Patrick isn't an apostle, nor is his church. And the apostles focused on developing elders within the local church who could run the church when they were gone. If Pastor DeVine made any serious efforts at developing elders from within the church, he did not mention it. He seems to have condescendingly given up hope that the church would ever be able to make strategic plans for its own future. The best thing they could do was give up control to a super church several hundred miles away. Where did all of these energetic new members come from, and why did Darrin Patrick's philosophy and ministry team suddenly attract them? Having shared my concerns, though, I will say that I am grateful to the Lord for using Pastors DeVine and Patrick to bring fresh life and hope to this church, and pray that it will remain a faithful gospel-preaching beacon for many years to come. Exploring Christian Theology is hard book to describe. Because actually it's not just one book, it's a series of books. But I'm writing a review about only one of the books because that's all I've read. Except that the one book is actually two books, with two separate authors, in one volume. But it covers three topics, not two. The first half is about church (ecclesiology) and spiritual growth (sanctification), and the second half is about end times (escatology). Apparently there will be other books in the series on other areas of Christian theology. It's not aimed at pastors. Pastors need information with more depth and thoroughness. It's also not aimed at baby Christians. Beginners don't need to know this much information. So it's aimed at people in the middle, perhaps Sunday school teachers who want to brush up on a certain topic without having to purchase a full library. For what it intends this book does well. For each area of theology, the book has a series of short, informative sections. A quick survey. Important Bible passages on the subject. The non-negotiable pillars of the topic. A detailed bibliography in case you want to dig in on a particular aspect of the doctrine in study. Probably the most interesting part to me was a selection of quotes from famous writers throughout church history. When it came to the doctrines of the church and sanctification, there was frightening disagreement throughout church history. But on the subject of the return of Christ, there has been reassuring continuity. I received this book from the publisher for free in exchange for an unbiased review. If you would like to own it next, let me know and I might send it to you for free!